Behind the cherry-red front door of Old Hand Tattoo is a shop that gives off the American traditional tattoo parlor aesthetic, with antique wood and leather chairs. Scattered around the shop are trinkets including a globe, a sewing machine and a vintage Fisher Price record player that spins classical music. There are also Old Hand T-shirts neatly folded on a table and apparel displayed near the entrance. Mitchell “Deso” DeSouza, 37, is the owner and primary artist of Old Hand Tattoo. After years of tattooing at his shop Virtuoso in Hurst, Texas for 15 years, Mitchell decided to put down new roots in Denton after getting a taste of the community while participating in local jiujitsu competitions. 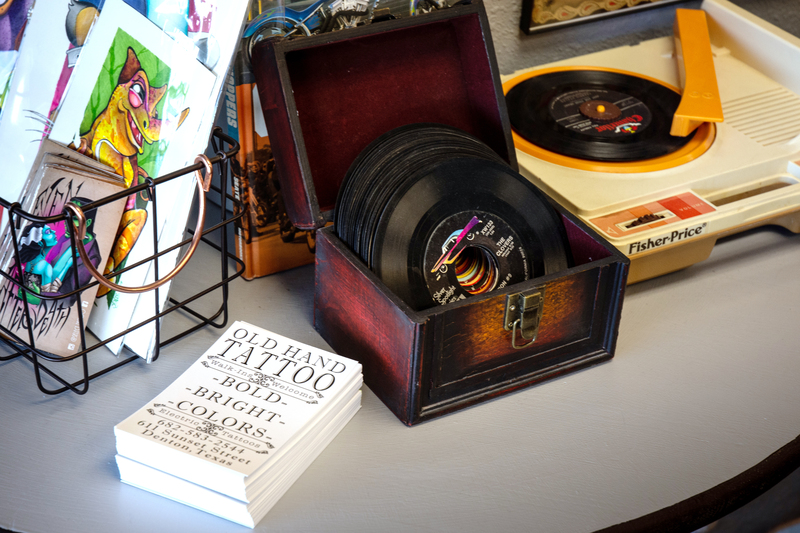 A collection of records sit on a shelf ready to be played at Old Hand Tattoo. Owner Mitchell “Deso” DeSouza decorates his shop with vintage items, adding to his shop’s American traditional aesthetic. Image by: Will Baldwin. Mitchell said the past three months Old Hand has been open to the public have been “beautiful” and the support he has received, from other local tattoo shops as well, has made him feel welcome. 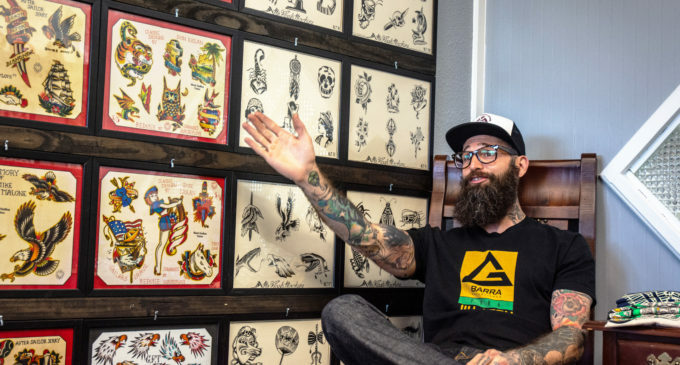 Over the course of the two decades he has been tattooing, Mitchell said he has learned the importance of making customers feel comfortable because tattoo shops can be intimidating for some people. Trey Burke, a friend of Mitchell’s, met him four years ago at a vintage motorcycle shop in Fort Worth and since then, has gotten tattooed by him. Burke said he trusted Mitchell’s artistic ability and wanted Mitchell to make his own mark with the tattoo he gave him. Tattoos cover the hands of Mitchell “Deso” DeSouza. Deso is the owner of Old Hand Tattoo, a new local tattoo shop. Image by: Will Baldwin. All of the merchandise in Old Hand’s shop, down to the jewelry, shirts, jeans and jackets, are made by either Mitchell or his wife Sonja, who tattoos under the name QD. For now, Mitchell is Old Hand’s only permanent artist, but he often invites guest artists to tattoo customers in the shop with him. In the future, he said he hopes to invite friends who are “master tattooers” in other parts of the world like Europe, Colombia and Asia to come to the shop and tattoo. “My wife is my best friend, and that was like a badge of honor for her because it empowers her being a mother and the way she carries our family,” Mitchell said. Sonja, who acts as Old Hand Tattoo’s Shop Collaborative Artist and Designer, said she is partial to Denton as well and supportive of the new era of tattooing that Old Hand will bring. Featured Image: Mitchell “Deso” DeSouza sits by a wall of flash tattoo designs in his new Denton tattoo shop. Mitchell is the owner and primary artist at Old Hand Tattoo. Image by: Will Baldwin.